David Andrew Laws, Hamlet Isn't Dead's humble Artistic Director, plays the enigmatic Buckingham in their upcoming production of Richard III. He's also usually the one who devises the questions for "Struts & Frets", so he deferred to a co-worker for this episode. If you prefer her work to his, please write to your state representative. HID: You know how this goes. What’s your favorite color? And what’s Buckingham’s? DL: My favorite color is magenta; has been for a while. I just discovered it in high school and remember thinking it was a color that needed more love. Buckingham’s favorite color is the same as whatever Richard said. HID: You serve as Richard's right hand man in villainy for a lot of the play. If Buckingham were an evil Disney-animated animal henchman what animal would he be? DL: I wish he could be a fox, but that conjures up too much of the already appropriated Robin Hood character. So, I guess, like, a red panda? Yeah, a red panda in a charcoal suit. Because Buckingham’s really manipulative as well, but he’s considered the “smooth” to Richard’s “rough”. So where people look at Richard, the toad, the spider, they look at Buckingham and they’re like “Awwww, princely Buckingham! How cute.” But that just lulls them into a false sense of security. Like real red pandas. HID: If you were able to do one truly despicable thing with no repercussions, what would you do? DL: I…I don’t think I’m allowed to talk about that on the Internet. My grandparents read this. But the most PG version would probably involve thievery. Something to put myself and Hamlet Isn’t Dead in a very comfortable position for the rest of our lives. But I'd take it from someone who wouldn't even know it was missing. Like, do you think Bill Gates would realize if a couple million went missing one morning? Well, he probably would, but it's my hypothetical. HID: If Buckingham actually got a bunch of titles and money, what would he buy on his first shopping spree? DL: Wait, you mean Buckingham doesn’t get-…ooohhhh yeah, that’s right. Well, if he actually got the titles and lands due to him (by promise! ), he’d probably hoard a lot of it and end up passing it on to his kids when he died. Buckingham doesn’t seem particularly impulsive. He plans and waits for the perfect moment to decide what to do. He might splurge on a few more dark suits first. Gotta keep up appearances in court, you know. Oh, we know. 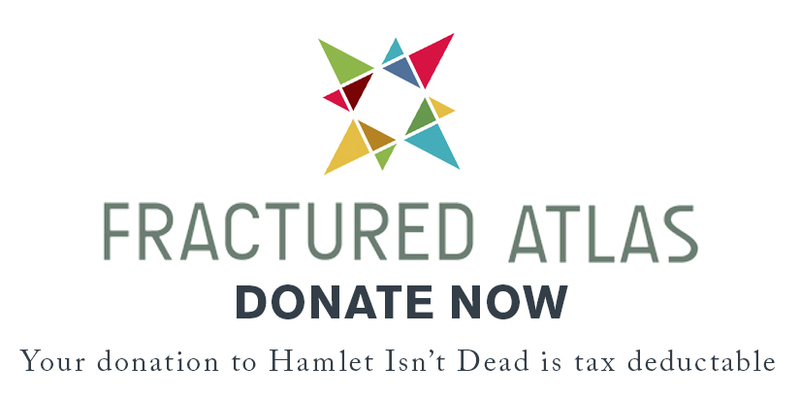 And if you’d like to know more about Buckingham (which, it’s obvious you do), don’t miss Hamlet Isn’t Dead’s Richard III opening March 20th. And if you need more incentive, opening night is also David’s birthday! So if you’re not gonna do it for yourself, at least do it for him.